Socrates, wise man, thinker, teacher and wanderer, lived from 470-399BC in Athens, Greece. He wrote nothing himself, but we know of him from others’ writings, especially those of his dedicated student, Plato. Plato wrote several Dialogues in which Socrates is the main speaker. The Dialogues give us an idea of Socrates’ life and concerns. From a humble background, he became a wandering teacher – a rather eccentric figure, roaming the Athenian streets and market places, chatting about life with anyone who would listen and talk. He was on a hunt for Truth. His discussions aimed at discovering what was Truth was and what it was not. In his discussions, Socrates would present contrary cases to show that what people thought was the case might not be so. How we should live and what makes a ‘good life’ were what mattered. For his efforts, he was sent for trial, accused of corrupting the youth and worshipping false gods. Plato, present at Socrates’ trial, later wrote The Apology – a record of Socrates’ defence speech. In this speech, Socrates explains the motivation for his search for Truth. He has visited the ‘Oracle’ – a revered priestess who gives predictions in mystical language. She had told him that no-one was wiser than he. Finding this hard to believe, Socrates questions people to find out how much they know. Discovering that in fact, knowledge is very slippery and hard to pin down, he concludes that his ‘wisdom’ lies in the fact that he acknowledges that he ‘does not know,’ whereas everyone else – mistakenly – think they do. His wisdom is that he knows that he does not know, whereas others do not. To live a moral life, we must discover how to make and keep the soul good and virtuous. Socrates believes that to know good is to do good. If we fail to do good, it is ultimately because of ignorance. If we really, really knew what was right, we could not fail to do it. Acts of evil are really acts of ignorance. This view has, of course, been challenged many times since Socrates’ time, but we need to bear in mind that Socrates is talking about a much deeper kind of knowledge than we normally mean when we use the word. At his trial, Socrates famously claimed that ‘the unexamined life is not worth living.’ Searching for truth, value and goodness gives life meaning and purpose. 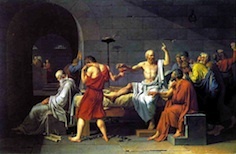 Unafraid of death, Socrates accepts the hemlock from his gaolers, choosing to obey the state’s laws and end his life, rather than abandon his principles and seek exile instead. In emphasising the importance of truth and wisdom to living an honourable and virtuous life, Socrates was a seminal figure in the early development of western philosophy. Follow the Philosophy links to find out how you can live the examined life today by doing Philosophy.